A wall having a batter. Continuing declines in retail sales in July and August, coupled with a badly battered Wall Street, the expectation of more retail bankruptcies if holiday sales are as poor as expected, and a crunch among mall developers, are forcing apparel retailers to increasingly focus on one area they hope will differentiate them from their competitors: exclusive celebrity licenses, including direct-to-retail and traditional agreements as well as through exclusive SKUs and/or promotions. 30am after being alerted by a 999 call, to find the forklift outside the battered wall, its engine still running. A switchback ramp scales a battered wall of rough granite blocks and you wonder if defenders will appear on the ramparts above and drive you off with rocks and boiling oil. The action takes place in front of a dingy, battered wall. 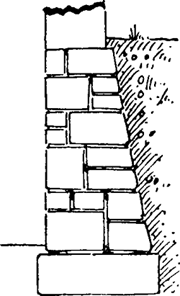 oors feature battered walls with a locally coloured stone or brick, while the upper ? Eco-friendly home gets go-ahead in Midlands; Alison Jones discovers the delights of owning a revolutionary 'energy neutral' family friendly eco house - which produces its own electricity and sells the excess it creates back to the national grid..
Santo Loquasto has fashioned a breathtaking downtown Manhattan loft space, with battered walls and enormous, grimy windows filtering soft light from the noisy street outside. The room itself will boast a glowing luminous ceiling, battered walls and display cabinets of solid cherry, and an intricate inlaid wood floor based on traditional Indian designs. The battered walls of the Roxy Club are not exactly a typical background for opera, but if they play host to more events of this kind, they could become a useful counterweight to the dignified columns of the National Opera of Estates Theatre. Advanced wall geometry now provides tapered and battered walls, cornices and reveals and ruled-surface walls, including curtain walls that can be created using lines, arcs or splines. Perspective down the green dock is enhanced by planting the battered walls with lonicera nitida, and by making very long parallel herbaceous beds full of plants chosen to be colourful and fragrant in most seasons, with paved and grass promenades between. What happened here and elsewhere in the Palestinian territories will not shake one hair on the head of the Palestinian children,' Mr Arafat said, as he examined the battered walls and broken concrete at a base for his Force 17 bodyguards at Khan Yunis in Gaza. On each side of it, light shoots down from lanterns onto dark, virtually black battered walls, which are given a curious, almost slimy texture (reminiscent of sea walls) by being sealed with linseed oil.